Daisy/Naomi on the tennis court. Daisy is 13 years old. Her tennis coach Francis Bryard describes her as an exceptionally polite girl who is a fighter at heart. She lost her father when she was four years old. As a little child, extremely attached to her father, she had a hard time getting over his death. Her mother pulled her through the most difficult period of both their lives. Daisy says getting over that tough phase made her the fighter that she is today. She is a girl of many words - eloquent in speaking and loves reading. She says she has little interest in sport with the exception of tennis. Noami is her nine-year-old little sister. Coach Francis says Naomi’s tennis technique is impeccable. Unlike Daisy, she is a girl of few words. She is shy and not a big fan of the books. Instead, she loves sports and is into volleyball, basketball and tennis. She accidentally came across the game of tennis at the young age of six. She saw some children in the neighbourhood practising with Coach Francis and thought why not. She then introduced the game to Daisy. She insists her older sister is better at the game than she is, while Daisy says they are both equally good. Week after week, Daisy and Naomi turn up for practice purely for the love of tennis. They do not even realise that this could be more than just a game. It could be an opportunity to attain a scholarship, a better education and an extraordinary experience of a different culture and way of life. Naomi does not even know what the word scholarship means - quite like Liwuslili Marie-Hyacinthe when she started 17 years ago. At that point, Marie was just nine years old. Quite like the sisters, she didn’t plan on anything. She loved the sport and she was good at it - as simple as that. Over the years, she went on to win several tournaments in the region and then eventually earned scholarships to study in Fiji and the United States of America. Marie fondly reminisces about her time overseas. While Fiji was quite similar to Vanuatu, the US was unlike anything she had experienced before. What stood out the most to her was the individualistic lifestyle in the US versus the community way of life in Vanuatu. While it made her feel lonely at times, she says, it also enabled her to become the strong, independent woman she is today. Having made the most of the opportunities and extremely appreciative of them, she came back home three years ago and decided to assist Coach Francis in building local talent and inspiring children in her community to follow her path. Clearly, her love for the game hadn’t dwindled over the years. Daisy, Naomi and Marie seem to mimic Coach Francis, who started teaching tennis in Port Vila about 20 years ago. At that point, he had no support, no infrastructure, no personnel - nothing. All he had was passion for the game, talent to play and teach it, a racquet and a ball. While his daytime job paid his bills, he taught tennis for free and he continues to do so till today. In fact, at one point, Coach Francis trained Vanuatu’s tennis star Cyrille Mainguy. They then got together and formalised tennis coaching in Vanuatu with the backing of the International Tennis Federation. 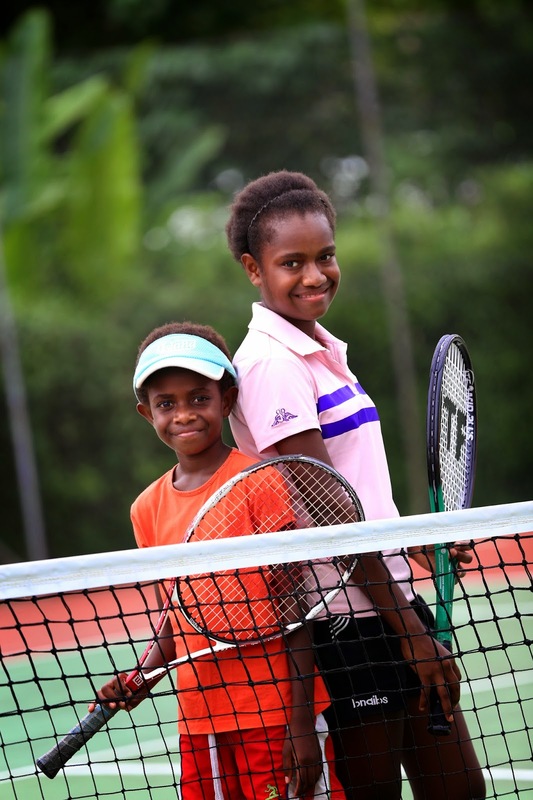 The past and the future of Vanuatu Tennis. Over the years, the number of students increased. Now nearly 60 students turn up every week for coaching. The quality of training and the players has improved drastically with time and experience. This is most evident watching the two sisters play against each other. When Naomi and Daisy are asked if they want to be like Marie, Noami quietly does what she does and lets the racquet do the talking for her. While Daisy vehemently says no, she does NOT want to be like Marie. She wants to be better than Marie. Spoken like a true fighter. Unfortunately, due to the lack of funding, these talented players are currently limited to regional competitions. But if that was to change, future Wimbeldon players, watch out for these kids from Vanuatu. This year UNICEF celebrates 25 years of the Convention on the Rights of the Child. All children have the right to play and join in a wide range of activities (Article 31). Play is not only a child’s inalienable right – it also influences physical, socio-emotional and cognitive development. UNICEF champions this right as fundamental to the health and growth of children everywhere.